We are launching a survey to understand better the impact of companies community engagement on employees attraction and retention in China. It only takes 3 min to fill in, please click on this link or scan the QR code below! Netspring went with Joseph Shi from the Austalian Chamber of commerce to visit Luxu Gaoxing Primary School, Wujiang. The school, sponsored by Faurecia, is currently in its third year of the Netspring Green IT classroom programme and it was good to see the students making use of the computers. Netspring also had a pilot introduction, to the kids and teachers, of an open-source coding software adapted to children. Several studies demonstrate that learning code improve children self confidence and problem solving capacities. The students enjoyed experimenting with this, learning how to do basic code to move characters around a screen, adding sound effects. This is in line with Nestpring mission to bringing more than just harderware but also addtionnal eductionnal value through computers. This is already the 4th time AmCham supports Netspring in organizing the collection of obsolete computers and electronic devices from their members. Donations will benefit to the Green IT classroom program as well as eco-friendly dismantling of Electronic devices. A total of 15 companies participated, until now 113 computers have been collected within which 63 will be refurbished. We are still waiting for additional computers from members which could not join the event. Aside from the computers, 151 kg of other equipments (printer, screens, cables,…) were collected to be sent to dismantling in a certified factory. A box of toys from Girl Scout will be handout to children in the schools during Netspring revisits. The event was a big success and we collected up to 53.5 kg of electronic devices! In 2014, Bayer China joined hands with Netspring and set up “Bayer Green IT Classroom” in Taicang Hengli Primary School, which facilitated the school with computers for each student in one IT class, with also three years of follow up and maintenance. Almost all the kids are from migrant families, so in order to bring more companionship and warmth to the kids and to know them better, volunteers from 7 different Bayer branches gathered together in Shanghai on 29th, Nov 2015 and came to Hengli Primary School for volunteer activity with funds raised among the employees. 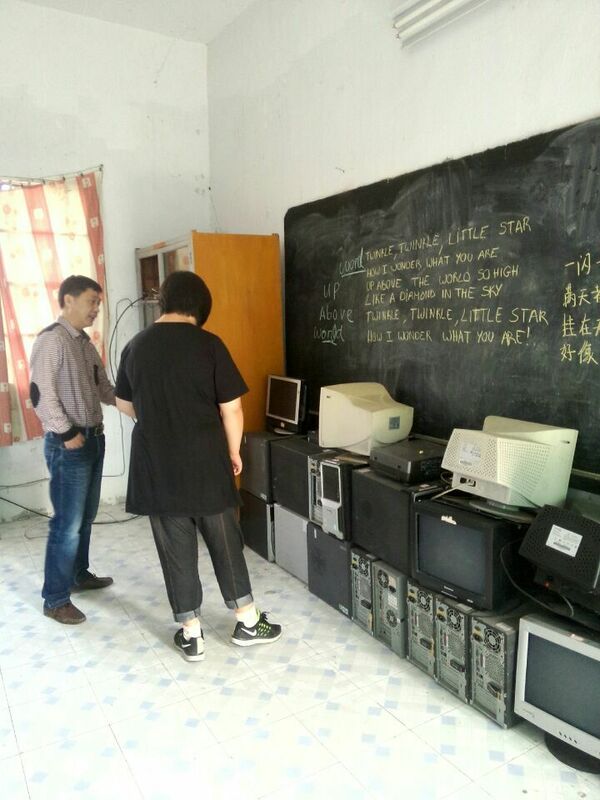 2015-11-23 Netspring setup 3 Geen IT Classrooms in Maoshi Town & Zhima Town, Zunyi, Guizhou province. The schools are built and supported in the past few years by local government and other charity organizations, which boasted new computer classrooms without computers. November 20, 2015 In the morning, Faurecia FOURTH Green IT Classroom and Faurecia art classroom were setup in Donghua Yucai School in Hi-tech zone, Chengdu. The guests attending this opening ceremony included: Kathy Sun, Vice President from Faurecia China Human Resource; Mrs. Carolin Miedreich, Faurecia Volunteers Ambassador; Chia-Lin Coispeau, Maverlinn Partner, Maverlinn Art Classroom and Netspring Green IT Classroom Program; Netspring team; and Pricipal LI Guang from Chengdu Donghuayucai School. After the ceremony, 20 corporate volunteers and two classes of kids in school together had two very special classes. Last Friday, StoraEnso together with Netspring setup one Green IT Classroom in Jiashan Chenqiao Primary School. There are 569 kids and 24 teachers in the school, most of the kids are from migrant workers' family, some of their parents are working in StoraEnso Jiashan factory. StoraEnso is a company for innovation. Just as CEO, Mr.Karl-henrik Sundstrom mentioned, there is innovation everywhere! StoraEnso cooperated with Netspring Green IT Classroom program, as an innovative way to combine company's social resposiblilty with volunteering to create shared value and happiness amony employees and school teachers and kids. During revisit in this June, we find the school have lots of big outdated and malfunctional CRT screens. To help the kids to have better multi-media class and also prevent school from mis-disposal of the e-waste, we discussed with school and provided refurbished LCD to replace 7 CRTs, which were brought back to eco-dismantling in Shanghai in this Oct..
Also new Math, Mandarin and English software were installed on the computers to support interactive teaching. We will track student progress during next visit. Supporting does not mean cheap and free, cheap and free can't support sustainedly! In order to have a better future, Netspring Green IT Classroom program worth your support! After 1 year running already, we could notice that computers really brought something to students; that much that school decided to open the IT classroom after regular class time! Teacher MeiXiangHuan(梅向环) made himself available to supervise those evening classes and give more opportunities for kids to practice their IT skills and discover the world though internet.